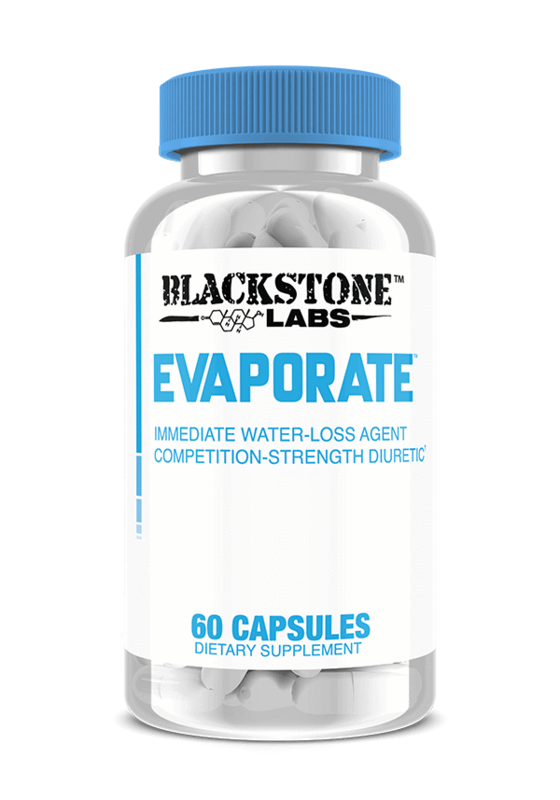 Evaporate is a competition-strength diuretic designed to immediately pull a significant amount of the water out of the body. This product is not intended for prolong use and contains ten servings per bottle. Vitamin B6 (100mg) reduces built up bodily fluids due to its water retention reducing properties.Magnesium (50mg) A vital mineral that helps reduce water retention in the body. Additionally, Magnesium also has been shown to help provide muscular strength and can alleviate high blood pressure. Taraxcum Officinate Extract (2000mg) Acts as an anti-inflammatory and reduces muscle spasms. Commonly used a natural diuretic, it also has been used in herbal medicines as a mild laxative and helps improve digestion. Uva Ursi Extract (1000mg) Acts as a diuretic and contains ursolic acid, powerful astringents, and helps promote the growth of healthy new cells. It is also used to help reduce inflamation, increase urine flow, and reduce bloating and water retention. Green Tea Extract (300mg) Enhances thermogenesis, metabolism, and fat oxidiation resulting in greater fat burning during exercise and while at rest. Horsetail (250mg) Increases urine production and has gained popularty as a treatment for kidney stones and UTI’s. Taurine (150mg) Helps alleviate high blood pressure, aids digestion, and helps reduce water retention and bloating. As a dietary supplement, take three (3) capsules after morning meal and three (3) capsules after mid-day meal, along with sixteen (16) ounces of water. Drink at least six (6) to eight (8) 8 ounce glasses of water daily. Do not exceed recommended dose.